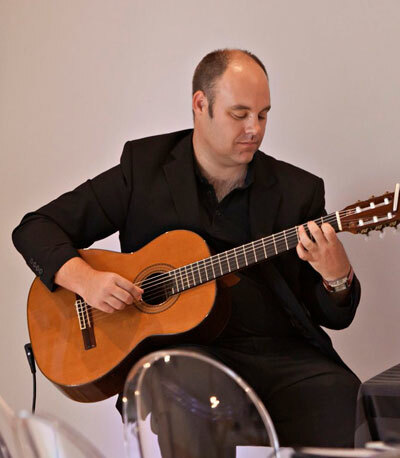 This guitarist specialises in playing his own beautiful arrangements of popular songs for solo guitar and can tailor a package to your individual requirements. 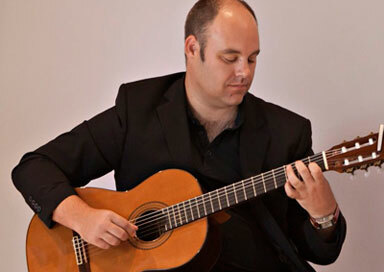 This guitarist specialises in playing his own beautiful arrangements of popular songs for solo guitar and can tailor a package to your individual requirements. He has 20 years experience of performing at weddings and typically plays during the ceremony & welcome drinks or the wedding breakfast. Many clients have expressed how much the live music complimented their special day, entertaining them & their guests. He discovered a passion for solo guitar and now performs at a variety of venues, providing sophisticated background music for restaurants, weddings, birthdays & garden parties. Playing live, without the aid of backing tapes, he is able to recreate classic songs from an ever growing repertoire, including songs from modern day musicals, Elton John, Sting & The Beatles – to more modern day artists like Robbie Williams & Coldplay. The songs are played on a classical guitar which is amplified to a suitable level.